Difficulty Students must be familiar with file input/output, basic probability and statistics (e.g., multi-variate Gaussian distribution), and have a basic understanding of western popular music (e.g., rock vs. techno genres). Strengths Music is interesting. Most college-aged students have an iPod, use Pandora, go to live shows, share music with their friends, etc. To this end content-based music analysis is a fun, engaging, and relevant topic for just about every student. Using music, this assignment motivates a number of important machine learning topics that are useful for computer vision, recommender systems, multimedia information retrieval, and data mining. Weaknesses Requires a bit of file management to get started. However, sample Matlab code has been provided to help with file I/O. Dependencies This lab can be done using any programming languages though Matlab or Python (with the Numpy library) is recommended. Variants Data Mining Competition: can serve as a "bake-off" assignment where students can propose and implement their own classification approach. Undergraduate Research Project: music analysis is a hot research topic and students are often interested in learning more about it. Related projects might include using digital signal processing to directly analyze audio content, text-mining music blogs, collecting music information extracted from popular social networks (last.fm, Facebook), and building music recommendation applications (iTunes Genius, Pandora). In this lab, you will learn how a computer can automatically classify songs by genre through the analysis of the audio content. We provide a data set consisting of 150 songs where each song can be associated with one of the six genres. 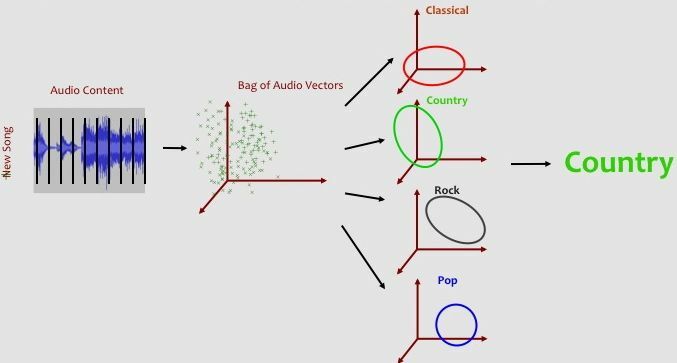 Each song is represented by a bag-of-feature-vectors. Each 12-dimensional feature vector represents the timbre, or "color", of the sound for a short (less than one second) segment of audio data. If we think about each feature vector as being a point in a 12-dimensional timbre space, then we can think of a song being a cloud of points in this same timbre space. Furthermore, we can think of many songs from a particular genre as occupying a region in this space. We will use a multivariate Gaussian probability distribution to model the occupying region of timbre for each genre. When we are given a new unclassified song, we calculate the probability of the song's bag-of-audio-feature-vectors under each of the six Gaussian genre models. We then predict that the genre with the highest probability. We can evaluate the accuracy of our Gaussian classifier by comparing how often the predicted genre matches the true genre for songs that were not originally used to create the Gaussian genre models. You are not expected to do any audio signal processing as part of this lab. Sample Matlab and Python code is also provided. Many textbooks provide a general background material on supervised learning (e.g., Russell & Norvig's AI: A Modern Approach and Duda, Hart & Stork's Pattern Classifiation). In addition, lots of information about supervised machine learning can be found on the web (e.g., Wikipedia). Echo Nest Analyze Documentation - provides a background on how the timbre-based audio features are computed using digital signal processing. It also provides information about other available audio features related to rhythm, key, tempo, harmony and loudness. Music Genre Classification of Audio Signals by Tzanetakis & Cook (2002)- a seminal work on the music genre classification problem. This paper is accessible to undergraduate AI students and provides them experience reading scholarly works. Exploring Automatic Music Annotation with Acoustically-Objective Tags by Tingle, Kim, & Turnbull (2010) - a more recent music classification paper that connects the Tzanetakis paper with the Echo Nest audio features. This paper also serves as an example of how an undergraduate student researcher (Tingle) can make a contribution to the field of music information retrieval. The main venue for music classification research is the International Society for Music Information Retrieval. If you are interested in reading more, the cummulative proceedings for 12+ years of research is online and publicly available for download. In addition, the Music Information Retrieval Evaluation eXchange (MIREX) is an annual evaluation for various music information retrieval tasks. Each year, music classification is one of the most popular tasks and you can read about the best performing systems. If you develop a solid classification system, consider submitting it to MIREX next year! This lab can be done using any programming language, although Python (with the Numpy library) and Matlab have been found to work well. In the data/ directory, you will find six subdirectories for six genres of music: classical, country, jazz, pop, rock, and techno. Each folder contains 25 data files for 25 songs that are associated with the specific genre. The relationship between a song and a genre is determined by social tagging and obtained using the Last.fm API. Your first step will be to load all 150 files into you program. The key will be to design a data structure that allows you to have access to each individual song's audio feature matrix (e.g, the time series of 12-dimensional audio feature vectors) as well as the metadata associated with each song (song name, artist name, genre). Before Moving On: your program should load the audio feature matrices and associated metadata from the 150 data files. To start, we want to concatenate the audio features matrices for each of the 20 training songs. This is done by taking all of the rows from each of the feature matrices for the trainings songs associated with a genre and combining them into one large feature matrix. This will result in a large nx12-dimensional matrix where n will be between of 10,000 to 30,000 audio feature vectors (i.e., 20 songs times about 800 feature vectors per song.) You can then either use built-in math library functions to calculate the mean and covariance for this big data matrix or you can write the code from scratch. We will also want to use a built-in math function to calculate the inverse of the covariance matrix. Note: Most programming languages (Matlab, Python-Numpy) have math libraries that provide useful mean, covariance, matrix transpose and matrix inverse functions. See the programming language documentation for details. To code these function from scratch, refer to an AI textbook, a statistics textbook, or Wikipedia for standard definitions of each concept. Before Moving On: you should have one mean vector (12-dimensional), one covariance matrix (12x12-dimensional), and one inverse covariance matrix (12x12-dimensional) for each of the 6 genres. where x is the 1x12 audio feature vector, mean_genre is the 1x12 mean vector calculate in step 2, and inverse(cov_genre) is the 12x12 inverse of the covariance matrix also calculated in step 2. Finally, we then find the average UNLL for all of the audio vectors of the song. Once we have calculated the average-UNLL for a song under each of the 6 Gaussian genre models, we simply predict the genre associated with the smallest average-UNLL value. If the true genre matches the predicted genre, we have accurately classified the song. Before Moving On: You should calculate the average-UNLL for each of the 30 test set songs and each of the 6 genre models. The accuracy of our system is the percentage of songs that are accurately classified by our system. For the given data set, you should get about 55% accuracy. While this might seem low, random guessing would get us about 16% accuracy (i.e., 1/6 chance). Note that your performance might differ based on how we randomly split our data into training and evaluation data sets. If you were to re-run this experiment a bunch of times, you would see that the performance bounces around a bit. However, if we take the average accuracy for a number of random splits, we would be able to better estimate the true accuracy of our system. This process is called random cross-validation. We can further explore the data by noting which genres are relatively easy to classify and which pairs of genres are often confused with one another. Try filling out the 6x6 confusion matrix to help you visualize this information better. One axis of this matrix represents the true genre label while the other axis represents the predicted label. The diagonal cells represent accurate predictions while the off-diagonal cells indicated which pairs of genres are likely to be confused with one another. To probe deeper into the results, you can look at individual mistakes made by our classification system. For example, you may find that the system predicted a pop song as being a techno song. However, upon closer inspection, the specific pop song may have a strong synthesized beat that is characteristic of most techno songs. This kind of qualitative analysis can provide us with a better understanding of how music genres are related to one another. Before Moving On: You should calculate the classification accuracy and confusion matrix for the Gaussian classifier. First, instead of learning a Gaussian Distribution for each genre, estimate the parameters (mean vector, covariance matrix) for each song in the training set. This will produce 120 Gaussian distributions. Second, calculate the average-UNLL between each of the 30 test set songs and each of the 120 training set Gaussian distribution. This will result in a 30x120 dimensional matrix. Third, pick a small odd number k (e.g., k = 1, 3, or 5). Then, for each test set song, find the "k nearest neighbor" songs in the training set. These are the k songs in the training set with the smallest average-UNLL. Fourth, use the genre labels for these nearest neighbor to predict the label of the test set song. For example, if the the five nearest neigbor of a test set song are associated with the genres [pop, rock, rock, jazz, rock], we would predict the song is a rock song because three of the nearest neighbors are rock. We can break ties randomly or use some other heuristic (e.g., closest neighbor wins). Once you have predicted a genre for each of the test set songs using the kNN classifier, you can evaluate the classifier using accuracy as described in step 5. What assumptions about the data do we make when we model the date using a Gaussian distribition? When do you expect that a Gaussian will work well and when do you think it will not work well? What values of k work best for the kNN classifier? Based on your results from this assignment, which classifier (Gaussian or kNN) works best for the task of Music Genre Classification? Why do you think each classifier performed as well (or as poorly ) as it did? Can you think of ways that you can modify the classifiers so that you might improve performance? Explore Your Own Music: Using the Echo Nest API, you can upload your own music. Also, if you want to check out a huge data set of music, you should check out the Million Song Dataset. Try Additional Audio Features: You can also use the Echo Nest API to get additional audio features that relate to tempo, key, mode, harmony, etc. Note that the file names in the data/ directory are Echo Nest Track IDs so you can obtain these features without owning a copy of the individual audio tracks. Alternatively, you use digital signal processing to calculate your own audio features. Develop Alternative Classifiers: In this lab, we focused on a Gaussian classifier and a k-nearest neighbor classifier. However, this is just one of many classification systems. Other common classifiers include a support vector machine (SVM), a Gaussian mixture model(GMM), or a hidden Markov model (HMM). Better yet, invent your own classification algorithm. I hope that you enjoyed building a content-based music classifier. Music information retrieval is a young and active research area. Once you have developed your ideas, consider submitting your work to theISMIR conference or entering your system in the MIREX evaluation exchange. Over the last decade, audio analysis has become a field of active research in academic and engineering worlds. It refers to the extraction of information and meaning from audio signals for analysis, classification, storage, retrieval, and synthesis, among other tasks. Related research topics challange understanding and modeling of sound and music, and develop methods and technologies that can be used to process audio in order to extract acoustically and musically relevant data and make use of this information. Audio analysis techniques are instrumental in the development of new audio-related products and services, because these techniques allow novel ways of interaction with sound and music. retrieval released under the Affero GPLv3 license (also available under proprietary license upon request). It contains an extensive collection of reusable algorithms which implement audio input/output functionality, standard digital signal processing blocks, statistical characterization of data, and a large set of spectral, temporal, tonal and high-level music descriptors that can be computed from audio. In addition, Essentia can be complemented with Gaia, a C++ library with python bindings which allows searching in a descriptor space using different similarity measures and classifying the results of audio analysis (same license terms apply). Gaia can be used to generate classification models that Essentia can use to compute high-level description of music. Essentia is not a framework, but rather a collection of algorithms wrapped in a library. It doesn’t enforce common high-level logic for descriptor computation (so you aren’t locked into a certain way of doing things). It rather focuses on the robustness, performance and optimality of the provided algorithms, as well as ease of use. The flow of the analysis is decided and implemented by the user, while Essentia is taking care of the implementation details of the algorithms being used. A number of examples are provided with the library, however they should not be considered as the only correct way of doing things. The library includes Python bindings as well as a number of predefined executable extractors for the available music descriptors, which facilitates its use for fast prototyping and allows setting up research experiments very rapidly. The extractors cover a number of common use-cases for researchers, for example, computing all available music descriptors for an audio track, extracting only spectral, rhythmic, or tonal descriptors, computing predominant melody and beat positions, and returning the results in yaml/json data formats. Furthermore, it includes a Vamp plugin to be used for visualization of music descriptors using hosts such as Sonic Visualiser. The library is cross-platform and supports Linux, Mac OS X and Windows systems. Essentia is designed with a focus on the robustness of the provided music descriptors and is optimized in terms of the computational cost of the algorithms. The provided functionality, specifically the music descriptors included out-of-the-box and signal processing algorithms, is easily expandable and allows for both research experiments and development of large-scale industrial applications. developers through its history. The 2.0 version marked the first release to be publicly available as free software released under AGPLv3. The complete list of algorithms is available online in the official documentation. The main purpose of Essentia is to serve as a library of signal-processing blocks. As such, it is intended to provide as many algorithms as possible, while trying to be as little intrusive as possible. Each processing block is called an Algorithm, and it has three different types of attributes: inputs, outputs and parameters. Algorithms can be combined into more complex ones, which are also instances of the base Algorithm class and behave in the same way. An example of such a composite algorithm is presented in the figure below. It shows a composite tonal key/scale extractor, which combines the algorithms for frame cutting, windowing, spectrum computation, spectral peaks detection, chroma features (HPCP) computation and finally the algorithm for key/scale estimation from the HPCP (itself a composite algorithm). The algorithms can be used in two different modes: standard and streaming. The standard mode is imperative while the streaming mode is declarative. The standard mode requires to specifying the inputs and outputs for each algorithm and calling their processing function explicitly. If the user wants to run a network of connected algorithms, he/she will need to manually run each algorithm. The advantage of this mode is that it allows very rapid prototyping (especially when the python bindings are coupled with a scientific environment in python, such as ipython, numpy, and matplotlib). The streaming mode, on the other hand, allows to define a network of connected algorithms, and then an internal scheduler takes care of passing data between the algorithms inputs and outputs and calling the algorithms in the appropriate order. The scheduler available in Essentia is optimized for analysis tasks, and does not take into account the latency of the network. For real-time applications, one could easily replace this scheduler with another one that favors latency over throughput. The advantage of this mode is that it results in simpler and safer code (as the user only needs to create algorithms and connect them, there is no room for him to make mistakes in the execution order of the algorithms), and in lower memory consumption in general, as the data is streamed through the network instead of being loaded entirely in memory (which is the usual case when working with the standard mode). Even though most of the algorithms are available for both the standard and streaming mode, the code that implements them is not duplicated as either the streaming version of an algorithm is deduced/wrapped from its standard implementation, or vice versa. Essentia has served in a large number of research activities conducted at Music Technology Group since 2006. It has been used for music classification, semantic autotagging, music similarity and recommendation, visualization and interaction with music, sound indexing, musical instruments detection, cover detection, beat detection, and acoustic analysis of stimuli for neuroimaging studies. Essentia and Gaia have been used extensively in a number of research projects and industrial applications. As an example, both libraries are employed for large-scale indexing and content-based search of sound recordings within Freesound, a popular repository of Creative Commons licensed audio samples. In particular, Freesound uses audio based similarity to recommend sounds similar to user queries. Dunya is a web-based software application using Essentia that lets users interact with an audio music collection through the use of musical concepts that are derived from a specific musical culture, in this case Carnatic music. An interested reader is referred to the documention online for more example applications built on top of Essentia. The detailed information about Essentia is available online on the official web page: http://essentia.upf.edu. It contains the complete documentation for the project, compilation instructions for Debian/Ubuntu, Mac OS X and Windows, as well as precompiled packages. The source code is available at the official Github repository:http://github.com/MTG/essentia. In our current work we are focused on expanding the library and the community of users, and all active Essentia users are encouraged to contribute to the library. Serra, X., Magas, M., Benetos, E., Chudy, M., Dixon, S., Flexer, A., Gómez, E., Gouyon, F., Herrera, P., Jordà, S., Paytuvi, O, Peeters, G., Schlüter, J., Vinet, H., and Widmer, G., Roadmap for Music Information ReSearch, G. Peeters, Ed., 2013. [Online]. Bogdanov, D., Wack N., Gómez E., Gulati S., Herrera P., Mayor O., Roma, G., Salamon, J., Zapata, J., Serra, X. (2013). ESSENTIA: an Audio Analysis Library for Music Information Retrieval. International Society for Music Information Retrieval Conference(ISMIR’13). 493-498. Bogdanov, D., Wack N., Gómez E., Gulati S., Herrera P., Mayor O., Roma, G., Salamon, J., Zapata, J., Serra, X. (2013). ESSENTIA: an Open-Source Library for Sound and Music Analysis. ACM International Conference on Multimedia (MM’13). Dataset of music excerpts labeled by TagATune game players. Analysis of structure are also possible by EchoNest. Dataset of birds song recordings with annotations. Processing recordings into feature vectors. Bluemindo - Bluemindo is a really simple but powerful audio player in Python/PyGTK, using Gstreamer. Bluemindo is a free (as in freedom) software, released under GPLv3, only. edna - an MP3 server, edna allows you to access your MP3 collection from any networked computer. The web pages are dynamically constructed, adjusting to directory structure and the files in those directories. This is much nicer than using simple directory indexing. Rather than directly serving up an MP3, the software serves up a playlist. This gets passed to your player (e.g. WinAmp) which turns around with an HTTP request to stream the MP3. MediaCore Audio/Podcast Player and CMS - Web based CMS for music management in video, audio and podcast form. All audio, video, and podcasts added to the system are playable from any browser. MMA - Musical Midi Accompaniment. If you follow the above link you will find that Pymprovisator is no longer developed due to the fact that there is this similar, but more powerful GPL Python software. Peyote - Peyote is an audio player with friendly MC-like interface. Peyote is designed specifically for work easy with cue sheets. Pymps - Pymps is the PYthon Music Playing System - a web based mp3/ogg jukebox. It's written in Python and utilises the PostgreSQL database. MusicPlayer - MusicPlayer is a high-quality music player implemented in Python, using FFmpeg and PortAudio. Pymserv - PyMServ is a graphical client for mserv, a music server. It is written in Python using pygtk and gconf to store prefs. Pytone - Pytone is a music jukebox written in Python with a curses based GUI. While providing advanced features like crossfading and multiple players, special emphasis is put on ease of use, turning PyTone into an ideal jukebox system for use at parties. Quod Libet - Quod Libet is a GTK+-based audio player written in Python. It lets you make playlists based on regular expressions. It lets you display and edit any tags you want in the file. And it lets you do this for all the file formats it supports -- Ogg Vorbis, FLAC, MP3, Musepack, and MOD. TheTurcanator - a small midi piano tutor for windows and mac. Includes CoreMIDI wrapper written in pyrex. LinuxBand - LinuxBand is a GUI front-end for MMA (Musical MIDI Accompaniment). Type in the chords, choose the groove and LinuxBand will play a musical accompaniment for you. audio-convert-mod - audio-convert-mod is a simple audio file converter that supports many formats. At just a right-click, you can convert any amount of music files to WAV, MP3, AAC, Ogg and more. audio-convert-mod was designed with the same principles as fwbackups - keeping things simple. SoundConverter - SoundConverter is a simple audio file converter for the GNOME desktop, using GStreamer for conversion. It can read anything GStreamer has support for, and writes to WAV, MP3, AAC, Ogg or FLAC files. Abjad - Abjad is a Python API for Formalized Score Control. Abjad is designed to help composers build up complex pieces of music notation in an iterative and incremental way. You can use Abjad to create a symbolic representation of all the notes, rests, staves, nested rhythms, beams, slurs and other notational elements in any score. Because Abjad wraps the powerful LilyPond music notation package, you can use Abjad to control extremely fine-grained typographic details of all elements of any score. Frescobaldi - is a LilyPond music score editor written in Python using PyQt4 and PyKDE4. Clicking a button runs LilyPond on the current document and displays the PDF in a preview window. There are some nice editing tools and a powerful score wizard to quickly setup a template score. mingus - mingus is an advanced music theory and notation package for Python. It can be used to play around with music theory, to build editors, educational tools and other applications that need to process music. It can also be used to create sheet music with LilyPond and do automated musicological analysis. music21 - a toolkit developed at MIT for computational musicology, music theory, and generative composition. Provides expandable objects and methods for most common theoretical problems. Supports music import via MusicXML, Humdrum/Kern, Musedata, ABC, and MIDI, output via MusicXML, Lilypond, and MIDI, and can easily integrate with notation editors (Finale, Sibelius, or MuseScore) and other audio and DAW software (via MIDI). pcsets - Pitch Class Sets are a mathematical model for analyzing and composing music. PyOracle - Module for Audio Oracle and Factor Oracle Musical Analysis. Friture - Friture is a graphical program designed to do time-frequency analysis on audio input in real-time. It provides a set of visualization widgets to display audio data, such as a scope, a spectrum analyser, a rolling 2D spectrogram. LibXtract - LibXtract is a simple, portable, lightweight library of audio feature extraction functions. The purpose of the library is to provide a relatively exhaustive set of feature extraction primatives that are designed to be 'cascaded' to create a extraction hierarchies. Yaafe - Yet Another Audio Feature Extractor is a toolbox for audio analysis. Easy to use and efficient at extracting a large number of audio features simultaneously. WAV and MP3 files supported, or embedding in C++, Python or Matlab applications. Aubio - Aubio is a tool designed for the extraction of annotations from audio signals. Its features include segmenting a sound file before each of its attacks, performing pitch detection, tapping the beat and producing midi streams from live audio. LibROSA - A python module for audio and music analysis. It is easy to use, and implements many commonly used features for music analysis. GNU Solfege - GNU Solfege is a computer program written to help you practice ear training. It can be useful when practicing the simple and mechanical exercises. athenaCL - modular, polyphonic, poly-paradigm algorithmic music composition in an interactive command-line environment. The athenaCL system is an open-source, cross-platform, object-oriented composition tool written in Python; it can be scripted and embedded, includes integrated instrument libraries, post-tonal and microtonal pitch modeling tools, multiple-format graphical outputs, and musical output in Csound, MIDI, audio file, XML, and text formats. Cabel - Visual way to create csound instruments. Dex Tracker - Front end for csound that includes a tracker style score editor in a grid, text editor, cabel tested with Python 2.5. Ounk is a Python audio scripting environment that uses Csound as it's engine. Cecilia is a csound frontend that lets you create your own GUI (grapher, sliders, toggles, popup menus) using a simple syntax. Cecilia comes with a lots of original builtin modules for sound effects and synthesis. Previously written in tcl/tk, Cecilia was entirely rewritten with Python/wxPython and uses the Csound API for communicating between the interface and the audio engine. Version 4.02 beta is the current release. Peace Synthesizer Framework - "Peace Synthesizer Framework" is Cross Platform Scriptable Real-Time Visualization & Sound. It has internal and external real-time scriptable visualization and sound generation and also support Nintendo system [Famicom] - like sound Emulation for 8-bits style chiptune music. Hypersonic - Hypersonic is for building and manipulating sound processing pipelines. It is designed for real-time control. It includes objects for oscillators, filters, file-io, soundcard and memory operations. audiere - Audiere is a high-level audio API. It can play Ogg VorbisAU, MP3, FLACAS, uncompressed WAV, AIFF, MOD, S3M, XM, and ITAN files. For audio output, Audiere supports DirectSound or WinMM in Windows, OSS on Linux and Cygwin, and SGI AL on IRIX. improviser - Automatic music generation software. Experiments in musical content generation. python-musical - Python library for music theory, synthesis, and playback. Contains a collection of audio wave generators and filters powered by numpy. Also contains a pythonic music theory library for handling notes, chords, scales. Can load, save, and playback audio. LoopJam - Instant 1 click remixing of sample loops, able to boost your creativity and multiply your sample loop library. Remix audio loops on a slice level, apply up to 9 FX to individual slices or create countless versions using LJ's auto-remix feature (jam) which re-arranges the audio loop forming musical patterns. Loris - Loris is an Open Source C++ class library implementing analysis, manipulation, and synthesis of digitized sounds using the Reassigned Bandwidth-Enhanced Additive Sound Model. Loris supports modified resynthesis and manipulations of the model data, such as time- and frequency-scale modification and sound morphing. Loris includes support and wrapper code for building extension modules for various scripting languages (Python, Tcl, Perl). MusicKit - The MusicKit is an object-oriented software system for building music, sound, signal processing, and MIDI applications. It has been used in such diverse commercial applications as music sequencers, computer games, and document processors. Professors and students in academia have used the MusicKit in a host of areas, including music performance, scientific experiments, computer-aided instruction, and physical modeling. PyObjC is required to use this library in Python. pyFluidSynth - Python bindings for FluidSynth, a MIDI synthesizer that uses SoundFont instruments. This module contains Python bindings for FluidSynth.FluidSynth is a software synthesizer for generating music. It works like a MIDI synthesizer. You load patches, set parameters, then send NOTEON and NOTEOFF events to play notes. Instruments are defined in SoundFonts, generally files with the extension SF2. FluidSynth can either be used to play audio itself, or you can call a function that returns chunks of audio data and output the data to the soundcard yourself. Pygame - Pygame is a set of Python modules designed for writing games. It is written on top of the excellent SDL library. This allows you to create fully featured games and multimedia programs in the Python language. Pygame is highly portable and runs on nearly every platform and operating system. .ogg .wav .midi .mod .xm .mp3. Sound output. midi input and output. Load sounds into numeric and numpy arrays. PyMedia - (Not updated since 2006) PyMedia is a Python module for the multimedia purposes. It provides rich and simple interface for the digital media manipulation( wav, mp3, ogg, avi, divx, dvd, cdda etc ). It includes parsing, demutiplexing, multiplexing, coding and decoding. It can be compiled for Windows, Linux and cygwin. pyo - pyo is a Python module containing classes for a wide variety of audio signal processing types. With pyo, user will be able to include signal processing chains directly in Python scripts or projects, and to manipulate them in real time through the interpreter. Tools in pyo module offer primitives, like mathematical operations on audio signal, basic signal processing (filters, delays, synthesis generators, etc. ), but also complex algorithms to create sound granulation and others creative audio manipulations. pyo supports OSC protocol (Open Sound Control), to ease communications between softwares, and MIDI protocol, for generating sound events and controlling process parameters. pyo allows creation of sophisticated signal processing chains with all the benefits of a mature, and wildly used, general programming language. Zyne - Zyne is a Python modular synthesizer using pyo as its audio engine. Zyne comes with more than 10 builtin modules implementing different kind of synthesis engines and provides a simple API to create your own custom modules. Soundgrain - Soundgrain is a graphical interface where users can draw and edit trajectories to control granular sound synthesis modules. Soundgrain is written with Python and WxPython and uses pyo as its audio engine. Pyper - (Not updated since early 2005) Pyper is a musical development environment. It allows you to write Python scripts that generates music in real-time. Pyper uses QuickTime Musical Instruments for synthesis. pySonic - (Not updated since 2005) pySonic is a Python wrapper around the high performance, cross platform, but closed source, FMOD sound library. You get all the benefits of the FMOD library, but in a Pythonic, object oriented package. PySndObj - The Sound Object Library is an object-oriented audio processing library. It provides objects for synthesis and processing of sound that can be used to build applications for computer-generated music. The core code, including soundfile and text input/output, is fully portable across several platforms. Platform-specific code includes realtime audio IO and MIDI input support for Linux (OSS,ALSA and Jack), Windows (MME and ASIO), MacOS X (CoreAudio, but no MIDI at moment), Silicon Graphics (Irix) machines and any Open Sound System-supported UNIX. The SndObj library also exists as Python module, aka PySndObj. The programming principles for Python SndObj programming are similar to the ones used in C++. It is also possible to use the Python interpreter for on-the-fly synthesis programming. PySynth - A simple music synthesizer. Snack - (last update: December 2005) The Snack Sound Toolkit is designed to be used with a scripting language such as Tcl/Tk or Python. Using Snack you can create powerful multi-platform audio applications with just a few lines of code. Snack has commands for basic sound handling, such as playback, recording, file and socket I/O. Snack also provides primitives for sound visualization, e.g. waveforms and spectrograms. It was developed mainly to handle digital recordings of speech (being developped at the KTH music&speech department), but is just as useful for general audio. Snack has also successfully been applied to other one-dimensional signals. The combination of Snack and a scripting language makes it possible to create sound tools and applications with a minimum of effort. This is due to the rapid development nature of scripting languages. As a bonus you get an application that is cross-platform from start. It is also easy to integrate Snack based applications with existing sound analysis software. AudioLazy - Real-Time Expressive Digital Signal Processing (DSP) Package for Python, using any Python iterable as a [-1;1] range audio source. Has time-variant linear filters as well as LTI filters using Z-Transform equations like 1 - z ** -1, as well as analysis (ZCR / zero crossing rate, LPC / Linear Predictive Coding, AMDF, etc. ), synthesis (table lookup, ADSR, etc. ), ear modeling (Patterson-Holdsworth with gammatone filters and ERB models), and multiple implementation of common filters (lowpass, highpass, comb, resonator), among several other resources (e.g. Lagrange polynomial interpolation, simple converters among MIDI pitch / frequency / string). Works mainly with Stream instances for its signal outputs, a generator-like (lazy) iterable with elementwise/broadcast-style operators similar to the Numpy array operators. Integrated with Matplotlib for LTI filter plotting, although it doesn't require Matplotlib nor Numpy for computation, DSP or I/O. Emphasizes sample-based processing while keeping block-based processing easy to be done, this package can also be seen as a highly enhanced itertools. Pure Python, multiplatform, compatible with Python 2.7 and 3.2+, uses PyAudio for audio I/O (if needed). Can be used together with Scipy, Sympy, music21 and several other packages, none required for DSP computation based on Python iterables. PythonSound - The Python Sound Project aims to develop a productive community around Python, Csound and other synthesis engines as tools for algorithmic and computer assisted composition of electroacoustic music. PMask - Python implementation of CMask, a stochastic event generator for Csound. eyed3 - eyeD3 is a Python module and program for processing ID3 tags. Information about mp3 files (i.e bit rate, sample frequency, play time, etc.) is also provided. The formats supported are ID3 v1.0/v1.1 and v2.3/v2.4. mutagen - Mutagen is a Python module to handle audio metadata. It supports ASF, FLAC, M4A, Monkey's Audio, MP3, Musepack, Ogg FLAC, Ogg Speex, Ogg Theora, Ogg Vorbis, True Audio, WavPack and OptimFROG audio files. All versions of ID3v2 are supported, and all standard ID3v2.4 frames are parsed. It can read Xing headers to accurately calculate the bitrate and length of MP3s. ID3 and APEv2 tags can be edited regardless of audio format. It can also manipulate Ogg streams on an individual packet/page level. ID3.py - This module allows one to read and manipulate so-called ID3 informational tags on MP3 files through an object-oriented Python interface. id3reader.py - Id3reader.py is a Python module that reads ID3 metadata tags in MP3 files. It can read ID3v1, ID3v2.2, ID3v2.3, or ID3v2.4 tags. It does not write tags at all. mpgedit - mpgedit is an MPEG 1 layer 1/2/3 (mp3), MPEG 2, and MPEG 2.5 audio file editor that is capable of processing both Constant Bit Rate (CBR) and Variable Bit Rate (VBR) encoded files. mpgedit can cut an input MPEG file into one or more output files, as well as join one or more input MPEG files into a single output file. Since no file decoding / encoding occurs during editing, there is no audio quality loss when editing with mpgedit. A Python development toolkit enables Python developers to utilize the core mpgedit API, providing access to mp3 file playback, editing and indexing functionality. m3ute2 - m3ute2 is program for copying, moving, and otherwise organizing M3U playlists and directories. m3ute2 can also generate detailed reports about lists of files. mmpython - MMPython is a Media Meta Data retrieval framework. It retrieves metadata from mp3, ogg, avi, jpg, tiff and other file formats. Among others it thereby parses ID3v2, ID3v1, EXIF, IPTC and Vorbis data into an object oriented struture. PyID3 - pyid3 is a pure Python library for reading and writing id3 tags (version 1.0, 1.1, 2.3, 2.4, readonly support for 2.2). What makes this better than all the others? Testing! This library has been tested against some 200+ MB of just tags. beets - music tag correction and cataloging tool. Consists of both a command-line interface for music manipulation and a library for building related tools. Can automatically correct tags using the MusicBrainz database. pyMIDI - Provides object oriented programmatic manipulation of MIDI streams. Using this framework, you can read MIDI files from disk, build new MIDI streams, process, or filter preexisting streams, and write your changes back to disk. If you install this package on a Linux platform with alsalib, you can take advantage of the ALSA kernel sequencer, which provides low latency scheduling and receiving of MIDI events. SWIG is required to compile the ALSA extension sequencer extension. Although OS-X and Windows provide similar sequencer facilities, the current version of the API does not yet support them. Some buggs are remaining in this package (for example when trying to delete a track), it has not been updated since 2006. This package is by Giles Hall. A sourceforge download. midi.py - (DEAD LINK) - Python MIDI classes: meaningful data structures that represent MIDI events and other objects. You can read MIDI files to create such objects, or generate a collection of objects and use them to write a MIDI file. MIDI.py - This module offers functions: concatenate_scores(), grep(), merge_scores(), mix_scores(), midi2opus(), midi2score(), opus2midi(), opus2score(), play_score(), score2midi(), score2opus(), score2stats(), score_type(), segment(), timeshift() and to_millisecs(). Uses Python3. There is a call-compatible Lua module. PMIDI - The PMIDI library allows the generation of short MIDI sequences in Python code.The interface allows a programmer to specify songs, instruments, measures, and notes. Playback is handled by the Windows MIDI stream API so proper playback timing is handled by the OS rather than by client code. The library is especially useful for generating earcons. portmidizero - portmidizero is a simple ctypes wrapper for PortMidi in pure Python. PyChoReLib - Python Chord Recognition Library. This is a library that implements the transformation from a list of notenames to a chord name. The system can be taught new chords by example: tell it that ['c', 'e', 'g'] is called a 'C' chord, and using its built-in music knowledge it immediately recognizes all major triads in all keys and all inversions/permutations. Comes with a real-time midi-input demo program (needs PyPortMidi). PyMIDI - The MIDI module provides MIDI input parsers for Python. Package not updated since 2000. PythonMIDI - The Python Midi package is a collection of classes handling Midi in and output in the Python programming language. milk - Superceding the older Nam, milk provides Python with classes representing key MIDI sequencer components: MIDI I/O, EventLists, Plugins and a realtime Flow class. The components can be freely interconnected in a fashion very similar to physical MIDI cabling, however the milk event system is not limited to MIDI events alone; you can define your own extensions should the need arise. Website says it is unpolished and unfinished. rtmidi-python - Another RtMidi wrapper. winmidi.pyd - A demo? of a Python extension interfacing to the native windows midi libs that developed from earlier attempts. win32midi - Some Python samples to demonstrate how to output MIDI stream on MS windows platform. Unlike previous links, these samples playback MIDI by directly calling the Win32 MIDI APIs without an intermediate portable library. It provides a simple player class for playing with MIDI sound using the synthesizer on the soundcard/onboard soundchip. A sample script is provided for testing it out. As it is still a work in progress, bugs are expected. Pyknon - Pyknon is a simple music library for Python hackers. With Pyknon you can generate Midi files quickly and reason about musical proprieties. python-music-gen - Simple library to generate midi patterns from numbers. Useful for building generative music tools. Twisted-osc - OSC Library for Twisted, an event-driven Python framework. It could really be ported to a non-Twisted framework as well, but is currently in the process of possibly become an official part of Twisted. aiosc - Minimalistic OSC communication module using asyncio. pyalsaaudio - This package contains wrappers for accessing the ALSA API (The Advanced Linux Sound Architecture (ALSA) provides audio and MIDI functionality to the Linux operating system) from Python. It is fairly complete for PCM devices and Mixer access. pkaudio - pkaudio is a collection of Python-based modules for midi input, osc communication with supercollider, and pyqt functionality. PyJack - This is a Python C extension module which provides an interface to the Jack Audio Server. It is possible to access the Jack graph to perform port connections/disconnections, monitor graph change events, and to perform realtime audio capture and playback using Numeric Python arrays. This is released under the GPL. mxdublin - mxdublin is an object oriented framework to generate events in pd and max. pd, short for Pure Data, a graphical Computer Music System written by Miller S. Puckette. mxdublin is a real time Python user environment working within pd/max. It is designed to put logic into a sequence of events. Python has been chosen has the interface language to build and run sequencing objects. Has a prerequisites, the users needs to know a minimal of Python and pd/max. net.loadbang.jython is a package which supports the Python scripting/programming language within MXJ for Max/MSP. We use the Jython interpreter, which allows Python and Java to interact, and gives Python access to the standard Java libraries (as well as any other Java code available to MXJ). OpenExposition - OpenExposition is a library aimed at automatic generation of user interfaces. The programmer only needs to specify what parts of the application need to be exposed to the user, and OpenExposition does the rest. At present, OpenExposition allows access to variables (either directly or through a pair of set/get methods), and class methods. It can construct the user interface graphically (using either the multi-platform FLTK library or Cocoa on Mac OS X), programatically (through Python), aurally (using the speech synthesis and recognition capabilities on Mac OS X), and by building MAX/MSP externals that can then be used in MAX/MSP. Py/pyext - Python script objects is an object library providing a full integration of the Python scripting language into the PD (and in the future Max/MSP) real-time system. With the py object you can load Python modules and execute the functions therein. With pyext you can use Python classes to represent full-featured pd/Max message objects. Multithreading (detached methods) is supported for both objects. You can send messages to named objects or receive (with pyext) with Python methods. Purity is a Python library for Pure Data dynamic patching. The idea is to be able to harness the power of Pure Data for audio programming without having to use its graphical interface. Python's clear and intuitive syntax can be used with profit in order to create intricate patches with advanced string handling, graphical user interfaces and asynchronous network operations. Purity uses Twisted, an event-driven Python framework. REAPER - "Audio Production Without Limits": REAPER is a professional digital audio workstation (DAW) for Windows, OS X and WINE. It comes with an uncrippled evaluation licence and supports advanced audio and MIDI recording, arranging and mixing. The support of several plugin formats (like VST, DX and AU) as well as the extremely flexible routing capabilities make it a powerful production suite. Since version 3.12 REAPER is scriptable with Python, allowing access to internal actions and parts of the API. Ableton Live - Award-winning commercial music creation, production and performance platform for Mac OS and Windows. Live is far and away one of the most interesting and groundbreaking audio recording and sequencing tools to come along in the past five years. Live uses Python internally and an experimental API has been exposed at this site, and there is a discussion group here. blue - blue is a Java program for use with Csound. It's interface is much like a digital multitrack, but differs in that there timelines within timelines (polyObjects). This allows for a compositional organization in time that seems to me to be very intuitive, informative, and flexible. soundObjects are the building blocks within blue's score timeline. soundObjects can be lists of notes, algorithmic generators, Python script code, csound instrument definitions, and whatever plugins that are developed for blue. these soundObjects may be text based, but they can be completely GUI based as well. Jokosher - Jokosher is a simple yet powerful multi-track studio. With it you can create and record music, podcasts and more, all from an integrated simple environment. Jokosher is written in Python and uses the GNOME platform and the GTK widget set. The audio engine is powered by GStreamer, and we use Cairo for some of the graphics. PyDAW - PyDAW is a powerful pattern-based DAW and plugin suite for producing electronic music. The UI is written entirely in Python/PyQt, and the audio engine in C.